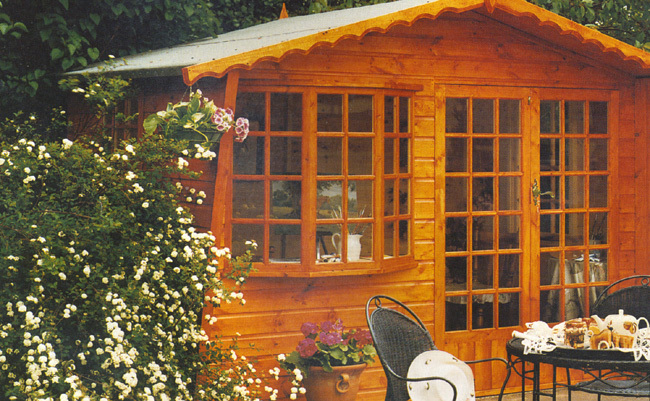 Floor to ceiling windows and doors available on many of our wooden summerhouses allow you to enjoy a glorious view of your garden from a cosy interior, somewhere to sit and relax, away from the TV, telephone and hum drum of the house. Enjoy a snug winter's day protected from the winter chill or fling the doors back and take in the shaded sunshine of a high mid summer evening. 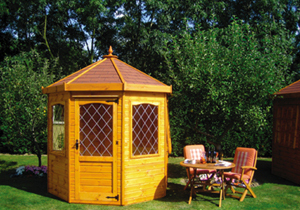 These summerhouses can be used for many garden applications from a hot tub canopy to an exterior dining room for entertaining in the hot summer BBQ months. 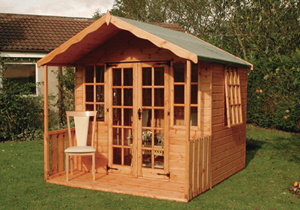 Savour the privacy of your garden with this well-defined summerhouse. Large three quarter glazed double criss-cross windows are fixed. 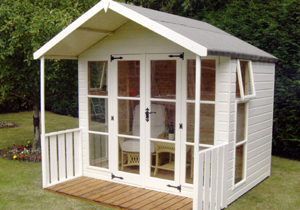 The matching single door creates a light and stylish chalet. The roof overhang is 300 mm (1'). 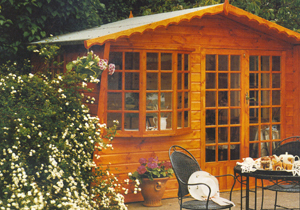 Photo shows 1980 x 1790 mm (7' x 6') Elton summerhouse. For further details on sizes and pricing contact us today. The many large windows allow panoramic views of your garden from which to enjoy the warmth of a summer day. Delightful with or without the optional verandah. The roof overhang is 300 mm (1') without verandah. Two opening side windows as pictured are supplied as standard. The front windows do not open. The photo shows 2690 x 1790 mm with optional 900 mm veranda (9' x 6' + 3' veranda). For further details on sizes and pricing contact us today. Ingeniously shaped to be primarily - but not exclusively - sited in a corner location providing an inspirational feature. 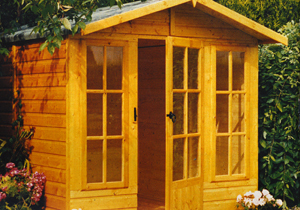 The Georgian style double doors and opening windows ensure ample light and ventilation whilst allowing a remarkably wide viewing angle room which to appreciate your garden. The photograph shows 2390 x 2390 mm (8' x 8') with optional window boxes. Not supplied with profiled fascia. For further details on sizes, options and pricing contact us today. Double doors co-ordinate with our unique bay window to give the Sandringham character and quality. Matching opening side windows are available as an option. The photograph shows 2990 x 2390 mm (10' x 8') with two optional opening side windows. For further details on sizes, styles and pricing contact us today. Painted finish for illustration purposes only. The Day Light summerhoues is available in various sizes. For full details on sizes and pricing contact us today. For further details and pricing contact us today. Fully-glazed Georgian double doors with antique hinges, ornate handle and lever lock. 2 front fixed Georgian windows. 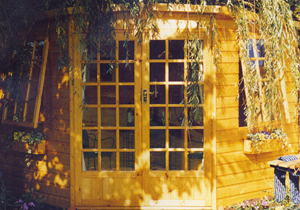 2 top hung opening Georgian side windows; roof canopy 1' or 300 mm. 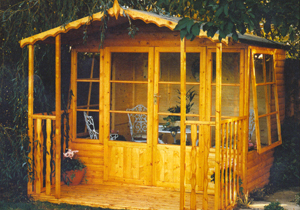 Photo shows 8' 6" x 8' Summerhouse with optional 2' 6" veranda. For further details on sizes and pricing contact us today.